Weekends are the perfect eggscuse for lazy mornings and big breakfasts, and now there’s another reason why you should get the pancakes on and the bacon under the grill…because eggs are healthier than ever before! A recent report revealed that eggs today are better for us than they were 30 years ago, due to the diets of chickens. Hens are no longer fed meat and bonemeal, but healthier foods such as vegetable oil, meaning that they are producing eggs with 70% more Vitamin D, 13% less calories and 20% less fat than previously. A medium egg now has just 66 calories, while a large egg comes in at 78. Adding two eggs to your diet every day will give you two thirds of your recommended amount of Vitamin D, which is essential for a healthy body, and they are full of protein. So get boiling, poaching and scrambling and enjoy a healthy breakfast this weekend! The Summer holidays have finally begun and many of you will be jetting off on holiday over the next few weeks…but have you sorted out care for your pets yet? For cat, rabbit and guinea pig owners in Salisbury, we have disovered a gem of a place to take your pet. The Riverside Cat Hotel is a luxury boarding cattery that has provided accomodation for cats for several years. With double-glazed units, insulated sleeping quarters, activity centres and an extensive feline menu, it has it all. But since April, owner Pam has welcomed rabbits and guinea pigs to stay too! 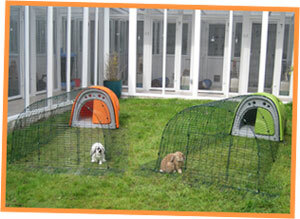 These lucky pets get to stay in a 5 star Eglu, where they can eat, sleep and run around as they please. We hear the garden views are great too! Due to its popularity, Pam plans to add more Eglus to the collection soon, but if you want to book your pets in to the Riverside Hotel, it’s best to do it quickly! 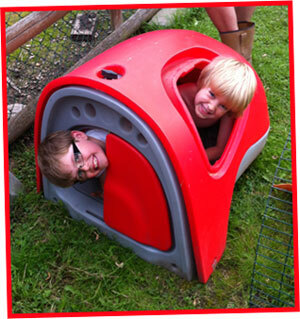 Book your bunnies into a boarding Eglu and they won’t miss you one bit! You’d be surprised how often we get sent photos of children in Eglus, but this one gave us a real giggle. Joanne’s sons Fin and Ewan decided they’d better test out the new chicken coop before letting the hens in, and they proved that it was definitely spacious enough. We can’t quite work out how the boys got out after their eggsperiment, but Joanne assures us that they evacuated before the chickens moved in! Omlet’s new delivery drivers are a right pair of double yolkers!